* I tried out Magnetic Eyelashes! I loved them- check out my full review HERE , they're great if you've never tried false lashes! * Watched the new Jumanji movie. Have any of you seen it? I thought it was pretty funny! * Received the best PR package from Pixi Beauty . There are so many products I can't wait to test out. Have you used any Pixi products? * Saturday Mani- What color should I get? I always have a hard time picking a Spring color! It's finally starting to warm up here so I'm thinking something light & bright. * I want to pick up some plants for our house! Do any of you have any houseplants that are low maintenance? * Cooking! Now that I'm older & Kyle and I head to my parents on Easter I like to make some things to bring over. This year I'm making my favorite spinach dip served with fresh sourdough bread from the local bakery, and a lemon cheesecake- YUM! * Easter Sunday- Does your family have any traditions? Every Easter morning we've always had a Jelly Bean hunt in our house. Living in Vermont it was usually too cold to go outside to look for eggs so my parents would always hide jelly beans around the house- they still do it, you're never too old for candy! I love Pixi products! Plus they’re available at Target which makes it so easy to snag the latest. I’m a huge fan of their brow gel and pencil. I’ve been wanting to see the new Jumanji movie but I’m the worst about going to the theater. Time to rent it! I’m going to get a bright manicure this weekend! Probably a hot pink! I love Pixi products! Those palettes are gorgeous! I love PIXI products so I was so happy when this arrived at my doorstep too. I hope you have a great weekend! I want to try out those magnetic lashes!! I do like falsies and use them from time to time but those seemed easier for everyday wear! Ahh so glad you had good luck with magnetic eyelashes. I need to try them again. I struggled but I love the concept. love the magnetic eyelashes! so fun!! I haven't watched the new jumanji yet! It seems so different from the original! I love Pixi products and that PR package looked amazing! And I haven't really liked my magnetic lashes, but I'm glad so many people do! Those Pixi goodies are everything! Im still in awe of my Pixi toner, must-have for MUA kits! I got that Pixi package too and am loving those products!! The lip palette is my fave! 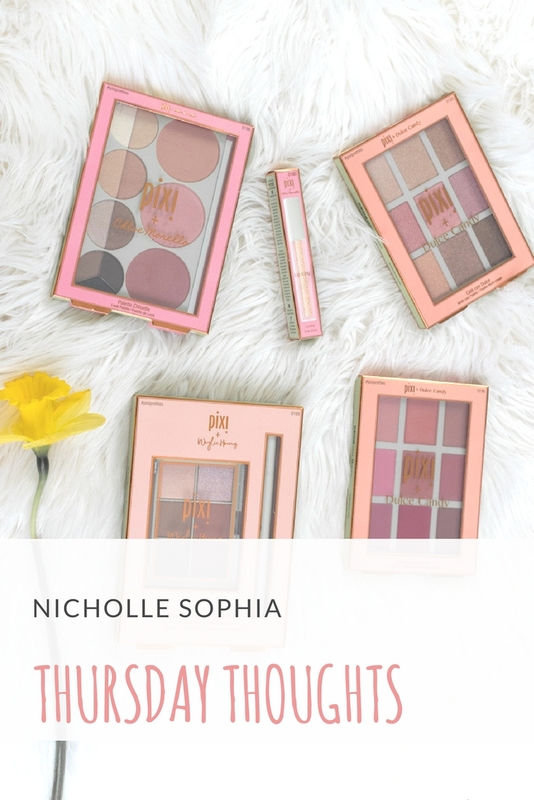 Those Pixi products look beautiful and right up my alley. May have to pick some up! I kill all plants but I know succulents are easy to care for.